Below is my journal response to Laugh, Sing, and Eat Like a Pig by Dave deBronkart. In the spring of last year, I began to blog as Rheumatoid Arthritis Warrior. I knew there were other patient blogs. I’d seen a couple – literally. I remember I’d read a few entries of Sara on Health Central and one other by a young woman with RA. Over the next several months, I found dozens of other patient blogs. Through Twitter, I heard the word e-patient (an abbreviation for empowered patient) and read some pages on e-Patients.net. Eventually, I began to also read some articles about healthcare social media. (The posts on this site relating to these topics are tagged healthcare social media.) It slowly dawned on me that my work was part of a greater movement toward patient empowerment. Why read the empowered patient book? Over the last year, the most prominent leader in the empowered patient movement has been Dave deBronkart who often goes by e-Patient Dave. 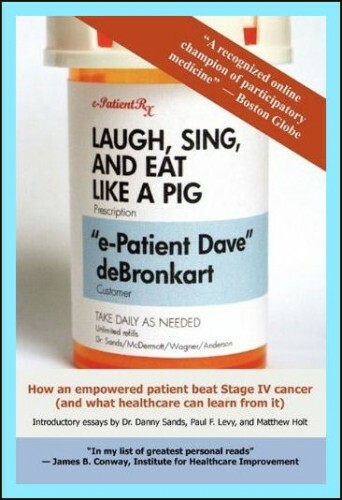 This spring, Dave published his first book, Laugh, Sing, and Eat Like a Pig: How an empowered patient beat Stage IV cancer (and what healthcare can learn from it). I didn’t buy the book for 3 reasons. I already work so many hours I don’t sleep enough. There are piles of books & magazines around me I don’t have time to read. I thought I might already know a lot of the lessons since I’ve absorbed this stuff like a sponge every day. For example, last year I learned from experience to Read the Doctors’ Notes & I told my readers they should too. I don’t have cancer and I’m already using the most aggressive treatments available for my Rheumatoid Arthritis so I don’t need it. This past week, I did buy the book for 3 reasons. I do need it. We are not as empowered as we ought to be. I want to see this expert example (Dave) up close. Another patient blogger on Twitter was enjoying it & I’m afraid I’ll miss out. I was already making an Amazon order. It’s pretty simple really. After reading the first chapter, I had an urge to write down my reactions. I thought I’d open a file, save up my notes and write a review eventually. Then I thought, why wait? I can share my experience with you! I’m planning to write my reactions to the book as I read right here on this page. I’ll keep the comment section open so we can make it a conversation. Maybe some of you will read the book with me! Please come back soon to read my reaction to chapter one below. Aug 8 – I’m tempted to skip a preface. But the 3 introductory essays looked different. Let these experts tell me why I should read this book. They are probably on our side! Historical role of pts and docs. Yep. That seems like a barrier. I had to tell people out loud about the 3 types of information Dr. Sands describes. It was a big revelation to me last year when I saw the doctor’s notes. Since I started recommending patients get ahold of them, there have been very interesting stories in comments! Probably information is a cornerstone to empowerment. Three kinds: Your history, medical literature, your records. Matthew Holt: “Dave had online messaging with his physician, and someday everyone will.” Epic change. 1. Its’ up to me. 2. When your instincts say scram, scram. 3. If they think your feelings are your problem, you might want to find someone else. 4. It’s worth traveling to find a doctor you work well with. I don’t know what the definition of learning a lesson is. But I think I might want to learn these better than I already have. I know these facts because I’ve had these experiences too. But I’m not sure I won’t let myself get burned again. This chapter had me re-evaluating some current decisions. Continued on the next page – click here! I’m humbled – seriously – and thrilled to see already-empowered people finding value in this book. Thank you so much. Thanks for the suggestions. That gives us even more to explore. As for me, I made kind of patient assertiveness confession recently. RA is a challenging field for a patient! Like I said there, I’m learning to use my mother-of-a-patient voice when I can’t find my patient voice! First, apologies for double-posting the previous comment – I was completely thrown off by the comments being on a separate page. I don’t think I’ve ever seen that before! 1. You’ll like the boxed sidebar somewhere in the book from nurse Kendra Bradley, research coordinator for my case. But I think your “mother of a patient voice” may be the best expression yet. I think I’ll be quoting you in speeches. Doncha just love social media? Yep I spotted Kendra already! I smiled at it, since I’ve already used my expression in a recent post. It is a truth about women: While we are used to giving in concerning ourselves, we know how to defend our young. I’ll read the mama lion tomorrow. Thanks. It’s too long while I’m writing tonight. No need to read the whole Mama Lion story – I just liked seeing this meme arising in several places. It could be a potent access point for change. The book sounds even more interesting after reading your and Dave’s discussion above. I’m intrigued by the “mother-of-the-patient” voice. I’m not sure but I think I’ve been in that mindset for a long time in working with my docs to acquire the best care possible. Now to go order my book! Thanks Kelly for including this new project among your many endeavors, and to Dave for sharing his story. I’m so glad that you are journaling your reading of Dave’s book. Knowing what the outcome is, I thought that I would know Dave’s story. But the book contains so much more than that. You’re doing a great thing here, Kelly. I hope that you truly understand that. You have made a difference in so many patients’ lives. Through your blog, through your research, through your advocacy, through just the sharing of YOU. Means a lot, Lisa. Thank you. My daughter just got home tonight from a summer in Fairfax. I hear it’s a hot a summer this yr.
With a title like this, how could you NOT want to read this book? HA! Now I know what to do with my Amazon gift certificate! Hey, didja notice that the book says all the resources I referenced are displayed in a handy clickable form at http://epatientdave.com/book/links/?? For instance, it links to the Seven Preliminary Conclusions online, here. Welllll, it’s just modern and user-friendly. Like me. And as the book says, it’s MUCH easier to update than a book is, if URLs change in the future. Well ya’ll I did read the Mama Lion story. I can’t recommend it enough. Take time to read it when you have time to finish it. I made the mistake of reading aloud to Katie Beth – not good because it really affected me. That wasn’t foreshadowing or sarcasm – that’s the real deal, exactly as I journaled it at the time! When I wrote that, I was experiencing pain and we had no CLUE that it was related to the kidney cancer: at that early date, all we knew was that the metastases were in the lungs. So, just as you read, I was like, “CRAP, why does my KNEE hurt now? ?” Well, bub, it was because you had a big fat hole being eaten out of the middle of the thigh bone. I survived three cancer surgeries and radiation. Not fun and one does possibly face a more immediate chance of mortality, but at those times I told everyone “This is just a blip on the radar screen of life; my real problem continues to be RA!” (which by then I had already lived with for almost 40 years–now 56)The cancers are gone; the RA is well-behaved with Enbrel and MYX. Life is good. Again, Kelly, I’m just amazed and thrilled that you’re finding value in this book. The LAST thing I would have imagined is that it would have been valuable for arthritis patients. Thanks for bein’ a blogger. Really good to be sharing thoughts. People power. Kelly, thanks for your generosity (as I think I said in an email) in sharing this perspective. As much as I talk about the power of patients connecting with each other, I never would have imagined it in this way. I hope at some point (probably when you’re finished) you’ll apply your formidable expressive skills to an Amazon review, so others who come browsing in the future will see this. Nail on head again, warrior. Everyone should just imagine the impact of having access to a new treatment 2-5 years sooner. Years of misery, shaved off. Wow. I would love to read this book, but will have to wait to see if he puts it out to ebook. I can no longer hold a regular book with my hands it just hurts way too much so now I have a nook and I can read again. I highly recommend it to everyone. Tara, I know Dave is checking in on our replies so let’s see what he replies about this. I will say I’ve had days when my hands can’t do that either & I am looking at some book holding devices but I haven’t found the perfect one. On bad days, I’ve propped my books on pillows & used a large hair jaw clip to hold the pages open. This is a fairly small book so that works. I was wondering if a loved one could read you the book? You guys amaze me. I’m learning a ton. Social media is really something. We’re now learning how to make an e-book out of it. This is taking longer than we thought but it’s in process. I’ll keep you posted. Recording it into a CD is a whole different project: it requires a studio, and audio editing, and that takes real cash. (Or does somebody know another approach?) So I don’t know when that might be possible. On the other hand, NY Times tech reviewer David Pogue wrote last week that the iPhone’s “disability reader” feature seems to work on ebooks – a capability that Amazon had to *remove* from the Kindle, because publishers insisted on separate royalties for audio. He remarked that the difference in legalities was puzzling. Anyway, that’s where we’re at. All suggestions welcome! Thank you Dave. I appreciate you taking the time to comment. Your book is making a bigger hit than you thought, I am happy for you. I am thinking of having one of my daughters read it to me in the meantime. Have a great day. So, Tara, would it be of value if I just recorded it, unprofessionally? I have no idea what the legal issues would be, but I could explore it. I’ve just presumed it needed to be professionally done. I dunno, but I’ll look into it. It is the ebook edition I would be interested in. I have a nook which is an ereader like the kindle. Where does one go to buy an ebook edition? Not Amazon, I presume, since the Kindle doesn’t support it? Any site that sells epub, adobe, or pdf will work for ebooks for the Nook. I like kobo, fiction wise, borders and of course Barnes and Noble, I can also check out ebooks from library2go. Getting hooked up with those sales channels takes a bit of time & work; until then would PayPal be okay? Pay pal is great Thanks Dave…..and thank you so much for taking the time to listen and respond to us. Hey, you RA Warriors, I thought I’d let you know that your interests and needs have altered the priorities that my publisher and I have been discussing. We’re going to punt our finicky desires to massage the Kindle version forever (e.g. this stuff), and instead push out a version that’s usable. He and I are both from the publishing industry so we want to use all our skills and beat the crap out of the project, but we hear you that you want/need it. DON’T HOLD YOUR BREATH but we now hope to have it finished this week. We’re also looking into an audio version that’s just me reading the book – not an in-studio version. Not sure what that will take, but this book is intended to be useful for people, not a big industrial project, so maybe we should go commando. Kelly, “silos” is a topic of major discussion around fixing healthcare. Someday we can discuss the many cultural and financial issues that keep this problem in place. There are places, like Mayo and Kaiser and Geisinger, that are trying to resolve it. A major structural issue is that the vast majority of the business of healthcare is driving by ability to get paid, which in reality means hooking up to insurance, which means doing things that have insurance billing codes, and having visit notes that can justify the insurance billing codes if audited. This leads to all kinds of dysfunctional behavior, e.g. “upcoding” (billing for the severest possible diagnosis on any visit), and conversely NOT billing for things that don’t have a diagnosis – for instance COORDINATING CARE. Boy, ain’t that the truth? I remember that fairy often, but not consistently. Thanks for saying this. In other news, it appears that we have the Kindle version just about done, and ePub too. You’ll be the first to know, here! Any day now. Kindle version is out! For some reason Amazon lists it as a separate book – here. Dave, thanks! It is exciting! I will let folks know! I read the kindle version, and when I added Dave to facebook he left a lovely note for me. I had a dream that night about my tongue growing mushrooms eww – not kidding! That book opened my eyes about taking control of my families health. You RA peeps are pretty amazing, you know. I had stress for six months and then it was OVER – I got to go out and play. You guys are in it a lot longer. It’s an honor to hear that you find value in the book. This tumor stuff is serious. It’s gross to have one on the outside, but after all that’s what grows inside cancer patients. I’m going to get serious about it for a minute, so if you don’t want that, stop here: my tongue thing fell off during treatment, and was gone. A friend’s fell off this year – interesting considering nobody I know has heard of a tongue metastasis. More “out” than me, he put a picture of it on his blog. (Ew.) Then he died this month. Whether it’s chronic or severe, I’m so inspired by the way social media let us talk to each other and share ideas so we can HELP HEAL HEALTHCARE. Dave, I’m sorry about your friend. I saw that on Twitter and I know it must have been hard for you. There is a lot of theorizing and arguing and laughing that goes on; but this is always about real lives of real people we really care about isn’t it? btw, on a completely unrelated note, EVERY patient who’s researching the treatment evidence needs to read this mind-blowing post: HTE – heterogenous treatment effectiveness. The unsettling news that treatment effectiveness and safety vary widely, with an (undocumented) claim from a drug company executive that MOST drugs work for less than half of patients. So much for assertions that we-all ought to shut up and just do as we’re told, eh? Has anyone tried the antibiotic protocol of Dr. Thomas Mc Pherson Brown MD? if you have heard of this before, it might be old news to you, but for new people that have never heard of it it might be a resource for them. the protocol is on the web under Road Back Society for people that have any rheumatoid disorders, which includes any arthritis but osteoarthritis. it tells how the use of low cost antibiotics reduces the infection factor, caused primarily by mycoplasms that infect the joints and other sites in the body. this doctor’s research, at a reputable university medical center, was discounted for many reasons at the time, mostly due to the reduction in need for any expensive medications by critics. this is explained in the book. his research shows this to be the main cause of serious arthritis. there are other countries that treat mycoplasms as the cause of these diseases. there is also a blog on yahoo groups that is for people using an antibiotic protocol. remarkable results using long term low dose antibiotic therapy, using primarily minocycline or doxycycline, have resulted in thousands being relieved of disfigurement and pain. there are a few rheumatologists in the country prescribing this protocol. Dr Mercola, a medical doctor with a website, posts one type of protocol he has used for many years on his website, which is how i found out about antibiotics being used for these disorders. but any doctor can do the prescribing if they are willing to believe that it might work. there is information and a book “The New Arthris Cure” which includes “The Road Back” book that describes the diseases. There is also some information on Dr Mercola’s site. Thousands of people have been put into remission on this protocol, rheumatoid arthritis being the original disease that was the start of Dr Brown’s research. according to Dr Brown’s research all rheumatoid disorders are caused by these micro organisms causing low grade chronic infection. some diseases may end up with additional infectious microbes but an additional med can be prescribed to help with this. Dr Mercola studied Dr Brown’s research and after his passing is one of the doctors that kept his work going. i have been on the protocol for 8 months and it has changed my life. my entire body was “stiff” and i could no longer lift my arms above my head or turn over in bed. my right knee was extremely painful and both shoulders and ankles were almost unable to be moved . these problems have resolved. my pain level is reduced by about 75 percent. i have a different disease but i have many features of rheumatoid arthritis. i am also a member of the yahoo group, rheumatoid disorders treated with antibiotics. but many people on the yahoo group’s website for “rhuematoid disorders using antibiotics” have rheumatoid arthritis. one of the orginal people treated in the book, which was written many years ago, is still in remission. and she is a member of the group and posts regularly. she has been in remission for many years with no return of the disease. this might be an approach to treatment that might be of interest to some of you. if you are interested in looking into this there are many websites regarding this approach to rheumatoid arthritis. there are many “hits” under mycoplasms and rheumatoid arthritis or mycoplasms in general. again,this may be old info to some of you but newer members might be interested in this information. i also do not sell anything, or any products at all, or receive any kind of income from these diseases. i just wanted to spread the word about alternatives to conventional treatments. Yes, this information is posted on the site periodically. There is one blog post here on the use of antibiotics as RA therapy – click here. Certain antibiotics have mild anti-inflammatory properties that we might consider similar to low-dose prednisone or meloxicam. I’ve interviewed doctors and researchers about whether they can be used as disease treatment to stop or slow RA damage or progresssion and they tell me so far there is not evidence to support it. Dr Alan Ebringer of King’s College, London is conducting research into both rheumatoid arthritis and ankylosing spondylitis. He gave a presentation on his findings at the Institute for Functional Medicine’s 2011 symposium “The Challenge of Emerging Infections in the 21st Century: Terrain, Tolerance, and Susceptibility” (April 28-30, 2011, Bellevue, Washington). He did not use “evidence-based medicine” to support his theory; rather, he used extremely sophisticated Popper sequences. His theory is that rheumatoid arthritis is caused by the microbe Proteus (and ankylosing spondylitis is caused by Klebsiella bacteria). I have a copy of his presentation and can send you his slides by email if you can let me have an email address to which to send them. The presentation itself is an audio MP3 recording and I don’t think it’s possible to send it electronically. The symposium proceedings are available for purchase from the Institute for Functional Medicine. Dr Alan Ebringer’s qualifications are B.Sc, MD, FRCP, FRACP, FRCPath. He is aware of Dr McPherson Brown’s research but thinks there is a better antibiotic to use against Proteus. I suspect he’s keen to get his findings out to patients, but there is a rather large stumbling block in the way. It’s called The Medical System. Actually, there’s no need for me to email you anything – it’s all on KickAs, an ankylosing spondylitis site. Your feedback on Dr Ebringer’s findings would be much appreciated. and it gives the list of technical papers. Kelly, please give me your opinion on this. I would be immensely grateful. I am not sure where to exactly post this, so I thought here would be as good as any. My husband and I are heading to a health mine in May and in all the research that I have done, there is nothing but good things to say about these radon health mines. I have tried googling methotextrate and radon gas to see if I could find anything of substance in regards to interactions between the two, and I haven’t had any luck with this. Do you or have you any further information on this? My rhumey said that it is ok to do as long as I don’t stop taking my meds. Any information that you could provide would be awesome! My ligaments are severing from my bones for no reason. My tendons have large, painful deformities. My ears disorient me with their ringing. I wouldn’t be in so much pain if I wasn’t so scared to move. They say I’m fine. My RA was diagnosed almost a year ago. I am 65 but started looking for a diagnoses almost 5 years ago and the more I read and learn I’m sure it started for me in my mid to late 40’s but they did not diagnose it completely until recently. Two of my dad’s siblings actually passed away from RA attacking organs. You describe so well my grief over the person I was and the person my mind still thinks I am. My ankle was broken 3 years ago and appeared to be healing until the foot and ankle started making loud popping noise whenever I walked. After the RA diagnoses I have been fitted with a Richie brace which helps my mobility to where I don’t fall as much but shoulder pain and fatigue is difficult to deal with. I found your website from the Women’s magazine article I picked up when I was waiting on a friend I have been taking for her radiation treatments for cancer. Extreme fatigue has plagued me since my early 40’s but I sort of just accepted it because I was working 14 to 16 hour days to support our family and I do have a high tolerance for pain. The post I just sent belongs to “The Me Before Rheumatoid Arthritis”sorry. I would have done it for you, but like I said I cant. It would say its from me! Just do it tomorrow & I’ll come delete the other one. It will be fine, dont worry about it. you have helped me so much before I started reading you felt like I was being lazy thank you Kelly for educating me. I found your website/blog in an article in the magazine “Women”, (sorry, I did not look and see the publication date)while I was a doctor’s office (you know, one of those specialists you end up going to when you have multiple autoimmune diseases). I haven’t had enough time to explore everything on your site/blog, but I find your purpose of trying to be an advocate for the patient and being a clearing house for the plethora of information, and misinformation, refreshing. I am a member of an online RA patient support group that has members from around the world. I will be mentioning your name there.